For bonsai-lovers in the Great Lakes region of the USA and Canada: The Matthaei Botanical Gardens, in Ann Arbor, Michigan, is pushing ahead on development of a permanent bonsai-display garden on their grounds. This will be open to the public. Here are two artist's renditions of what the garden will look like when finished. These images are from Jerry Meislik's website (see "Chairman's info," below,) and are used with permission. 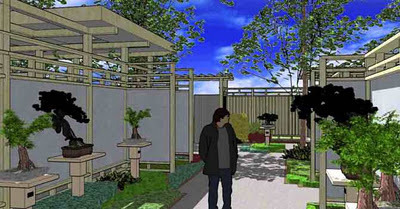 Plans include a working bonsai studio. Professionals and volunteers will care for the trees and be available to assist visitors. Why do I think this is worthy of attention? Public resources for bonsai awareness, education, and appreciation are still scanty in much of this part of North America. 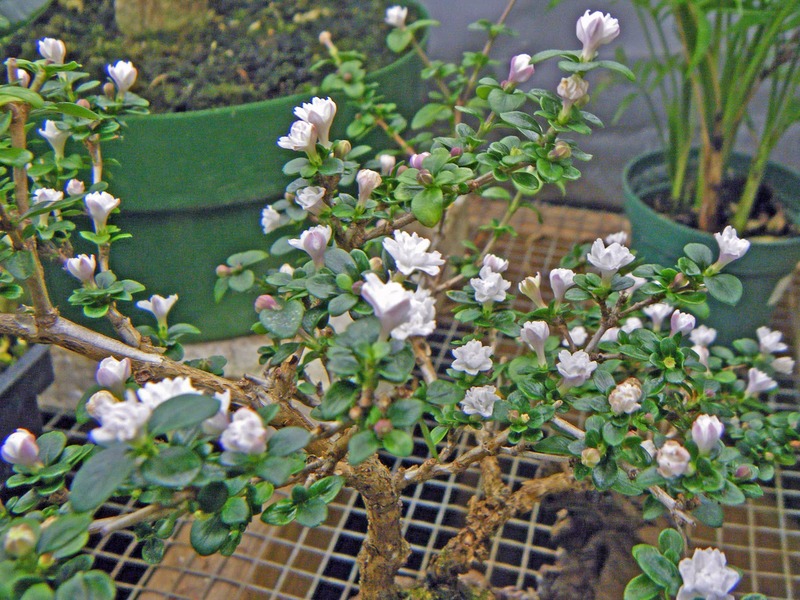 There are --unless I've missed something -- less than a dozen permanent bonsai collections, open to the public, in the eastern Great Lakes region. 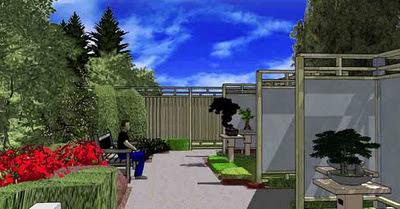 The Matthaei Bonsai Garden will be part of filling that void. Pot by the late Max Braverman. The mulch is sphagnum moss. The tree had some new aerial roots sprouting from the lower trunk, and I wanted to force them to fuse to the surface of the trunk. That would both create more visual interest at that point, and increase the visual weight of the lower trunk -- bulk it up, in other words. So I bound those aerial roots to the trunk using veterinary bandage, a fabric product that is partly self-adhesive and lets both water and air pass. It also stretches somewhat, but I (truly) thought that I had pulled it tight enough, as I applied it, to pull all the "stretch" out and so create a tight wrapping. Here's a picture of the tree just after I finished. The little white streaks are falling snowflakes. Nice and chilly, of course, is how hardy trees need to be kept thru the winter. I went out this afternoon to check on my trees under "the rack." 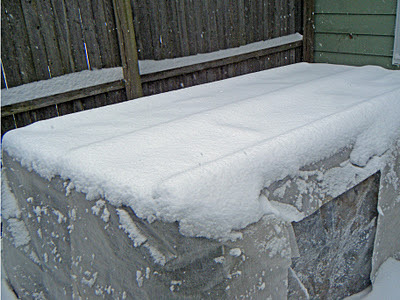 (For an earlier post on overwintering my hardy trees, click here.) There is a nice blanket of snow on top of the fabric cover, which, for non-bonsai friends and those in the tropics, is a good thing. Besides being an insulator in itself, snow reflects the sun's infrared rays, preventing them from heating up the space inside. That helps keep the trees safely dormant until spring. "And the bloom goes on, and the bloom goes on!" In an earlier post, I said that my 'Snow Rose' serissa appeared to be gearing up for a period of blooming. It now appears to be fully geared up, and is blooming merrily! Here are a few more pictures, taken this morning. Many branches are covered with blossoms. 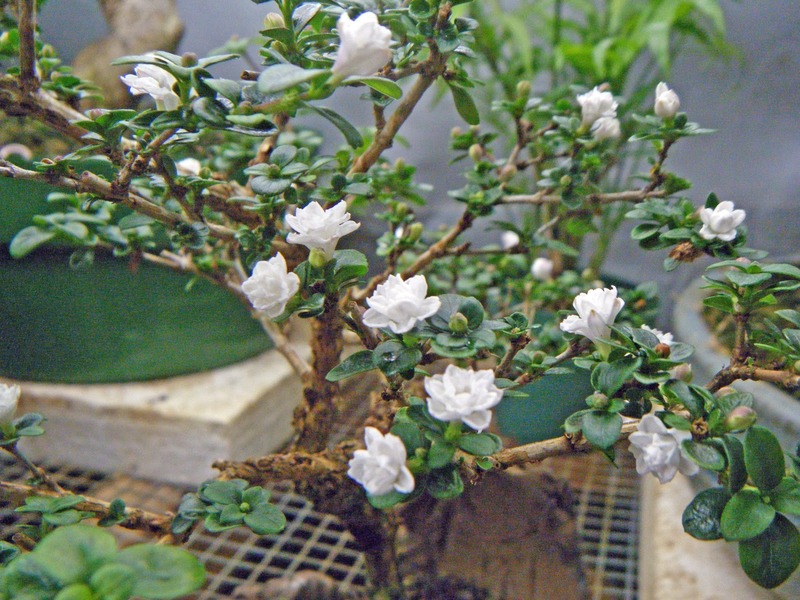 I have never gotten seeds from a 'Snow Rose' serissa. Many named cultivars, of different species, are sterile. But the flowers alone make this plant worth growing! Kudos to whoever prepared this link: they did their homework! You can recognize several of the species from the drawings, and the five basic trunk styles are depicted quite well. While the information on this link is limited, what is there is accurate. Don't I have some things that just have to go by snail-mail in the next week or two ...? Picture by Jason Schley. Used with permission. 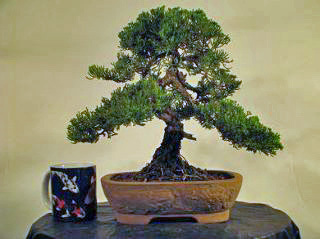 This juniper bonsai was stolen from Jason Schley, of Schley's Bonsai in Deland, Florida. The theft occurred sometime within the last week; if I infer correctly, Jason was away and returned to find it missing. The tree is a Juniperus procumbens nana, also known as "Japanese garden juniper." It stands 9 inches tall (about 23 cm.) The Japanese-made pot is signed with the potter's chop mark. This, I understand, was one of Jason's first trees (if not the first,) and means a lot to him for several reasons. It was a gift from his mentor, for one thing. On top of that are the time and work that Jason, and his mentor before him, put into bringing it to the point at which it is now. If you should see this bonsai, or learn anything about it, please contact Schley's Bonsai, or the authorities. "These are a few of my favorite blogs ..."
Having gotten into the blogging world, I've discovered a number of other blogs that focus on bonsai. Some are excellent and active, some are excellent but less active; but all the ones I've run into so far are at least worth a look from time to time. Here are the two that I read the most at this point. Both are active, and very good for information and inspiration. In a day or two I'll mention some others that I think are worth a look. 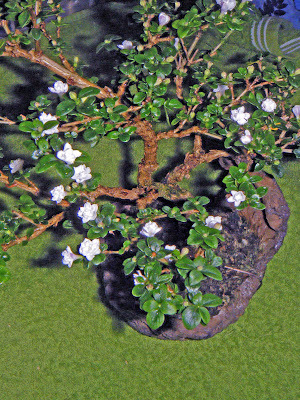 Bonsai Eejit is the on-line bonsai diary of Ian Young of Belfast, Northern Ireland. Ian has been in bonsai for over 15 years and does a good deal of collecting. Besides being an accomplished bonsai artist and a witty writer, he is an excellent photographer: the pictures he takes on his country walks are a treat! Bonsai Bark is the blog maintained by Wayne Schoech of Stone Lantern Publishing. 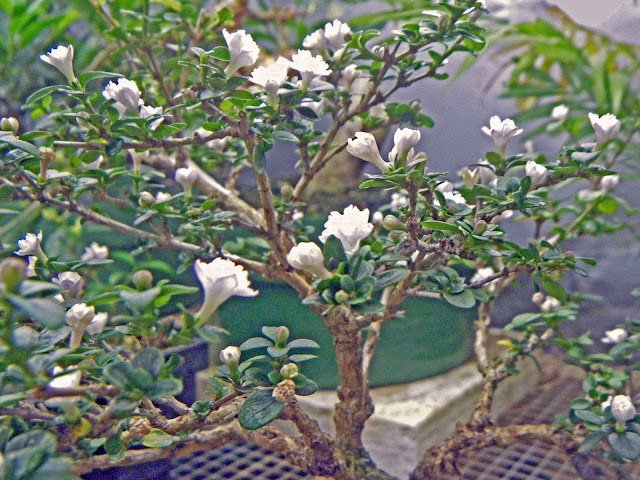 The blog's motto is "Promoting and Expanding the Bonsai Universe." 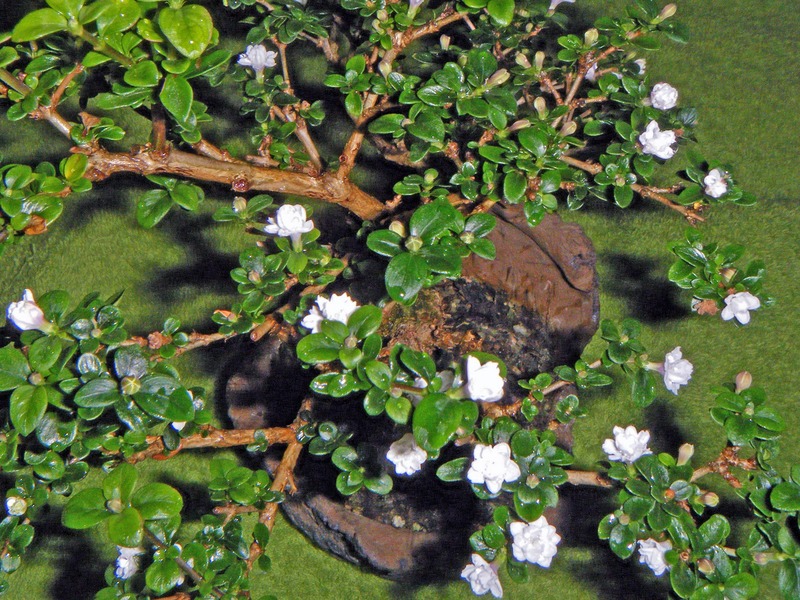 What I appreciate most on Bonsai Bark are Wayne's periodic critiques of fine bonsai. His comments are always perceptive, articulate, and concise. My own eye is being refined, I find, as I read what he has to say about those trees. In the Bonsai Crate. Plenty of new buds coming on! A top view. Click the picture to enlarge it. Here are a couple more views, from slightly different angles and in different light. Showing more of the tree's structure. I've had trouble getting clear pictures of the flowers indoors, and I believe I now know why. The flowers are pure white, and throw back so much light to the camera that they partly wash out their own images! My wife is fond of the flowering trees I have (I don't have that many,) and that definitely includes this one. 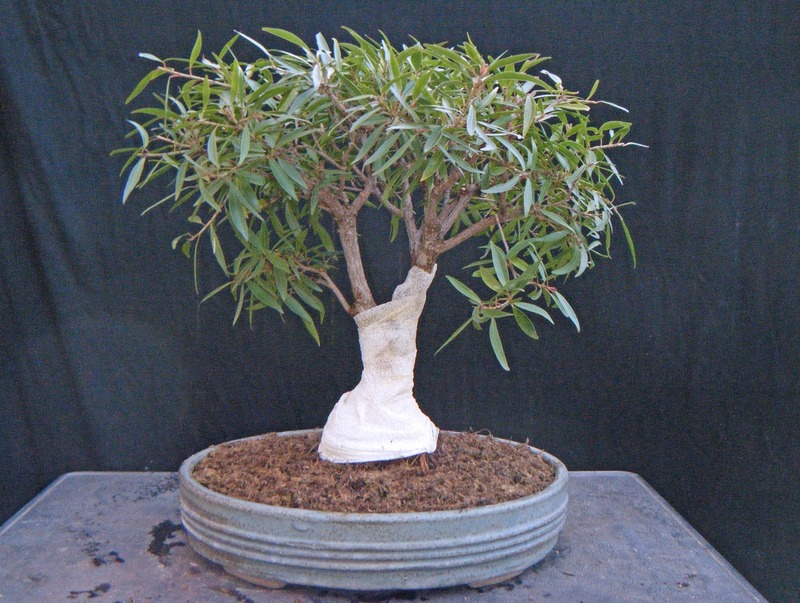 The "scoop pot," for those who are interested, is by Dave Lowman of DaSu Bonsai Studios. 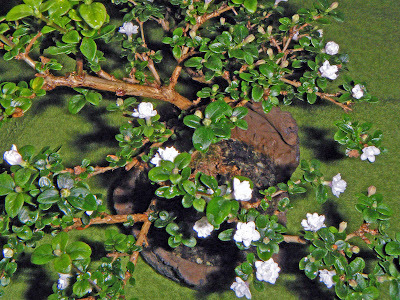 My largest Fukien tea (Carmona microphylla) is also blooming, but not as enthusiastically at present. 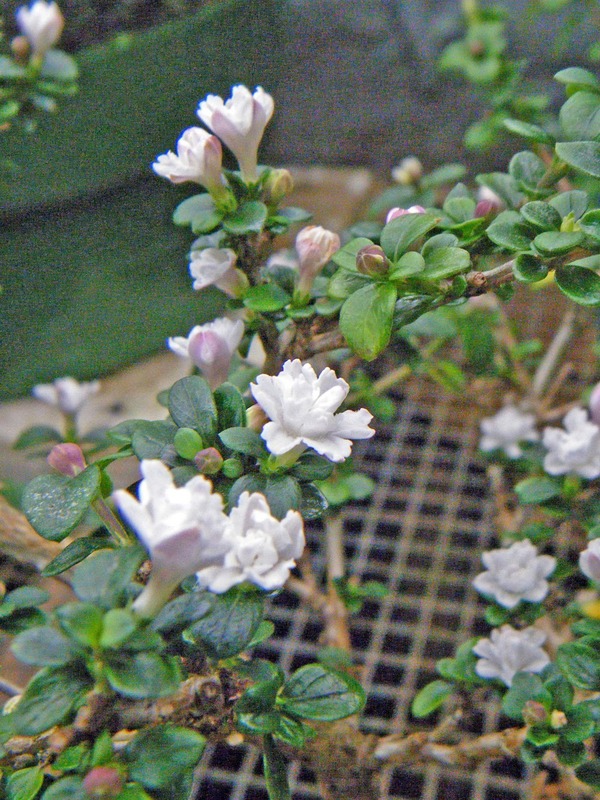 Its flowers are also tiny and white, but single. I may be able to get an interesting picture of it in a week or two.